← Wild Ride With Steve and Ben! 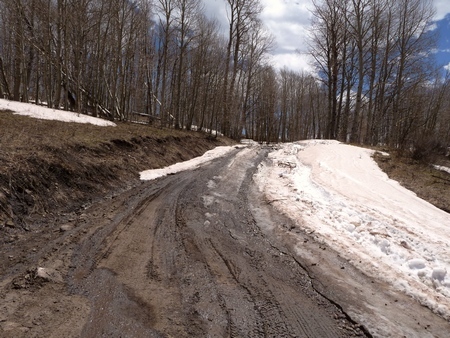 After exploring Ouray County Roads 2 and 4 on May 21st, Glenn Neigenfind and I went up Buckhorn Road to see what we could see. We got pretty close, as shown in the GPS track below, but snow and mud made us turn around. Buckhorn Road from U.S. Highway 550 to our turnaround point. Click on image for a larger view. Use your browser's back button to return. Buckhorn Road heads east from U.S. Highway 550 just north of Colona (by just north, I mean a couple hundred feet), and heads to the east. The first part is paved. The rest is good road for a 4WD vehicle—or a dirt bike or four-wheeler. The upper part of the road winds between Montrose and Ouray Counties. The road heads up gradually but surely, gaining significant altitude. It also offers some stunning views, so stop every so often and enjoy them. I should note that the lower stretches of Buckhorn Road gets pretty wash-boarded as the summer goes on. We turned around when we got to this. Glenn is far more experienced than I and I don't think this would've stopped him, but I didn't want to go further. We made it as far as shown in the picture, which you can see from the GPS track is not far away from the lakes, so as I write this the road may be open all the way. The two lakes offer primitive campsites and (I presume) good fishing. There is another road that heads way, way up the hillside, but I probably won’t try that until August. I like Buckhorn Road because it’s an easy ascent and provides spectacular views. Again, it’s not popular with the out-of-towners simply because it’s not in the “high country,” yet the upper stretches are as beautiful as any.